The eighteen classical weapons consist of nine long weapons, such as staff, spear, and the halberd; and nine short weapons such as double daggers, swords, and axes. The Chinese adopted most of the long weapons from the Mongols. But Chao Kuang Yin the emperor invented the three sectional staff. The southern Chinese, for urban type warfare, developed most of the shorter weapons. 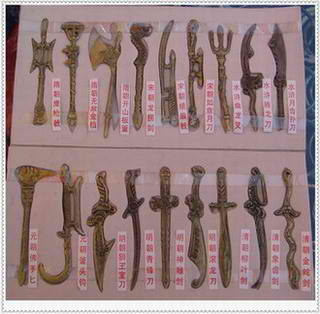 Shaolin handed these weapons down over the centuries although there were some variations in some of the family styles. Hence different Kung Fu systems may place emphasis on different weapons. For example some say spear is the king of long-range weapons while others state that it is in truth the staff. Even though primarily the staff and the sword are emphasized for mastery, one who wishes to master the Chinese martial arts should be familiar with all the weapons. For “Master” status it is essential that the artist specialize in at least one long weapon and one short weapon. To obtain “Grandmaster” status a Kung Fu artist must have a working knowledge of all the weapons, but is only expected to have two mastered. Even though it is essential to master one short weapon and one long weapon, this may vary depending on body styles, personal preferences, etc. For example, Grandmaster Share K. Lew is a master of the steel whip (his long weapon), preferring the nine and seven linked weapons. His uncle mastered the dart (a secret weapon) and was able to put a candle flame out from twenty feet away; thus he was also able to hit any point on the human body from the same distance. The reasons that weapons were mastered differently were due to many different aspects. Some weapons were developed and different due to region. For example, the Kun Lun daggers were developed in the mountain ranges of northwest China and are a favorite among Ba Gua practitioners. The butterfly knives were developed in southern China and were the favorite among the Cantonese. Twenty seven weapons are included on the list below taking into account some of the family styles. Secret weapons are listed for reference only. Some of the secret weapons include the flying guillotine, projectile weapons, as well as hidden weapons, and even weapons that are hidden within other weapons. Most of these utilize an aspect of surprise for attack. Here at the Shaolin Temple we teach weapons from all the styles taught here at the school to develop your short and long weapon skill so you can become a great Martial Artist. Secret weapons: Chan These are taught to Direct Inheritors Only.